Dillin’s dependable Lift Rail Accumulation allows for controlled in-line product accumulation during minor equipment downtime events or change-overs. Strategically positioning this style accumulator downstream of high value producers such as a Filler, Cartoner or Over-Wrapper allows for consistent production flow ensuring optimum production performance. This Lift Rail Accumulation can be integrated with Dillin’s: Product Handling Conveyors, Merge/Divert Stations, Vertical Accumulators, Gripper Lifts or Carton Turners to complete your production system requirements. 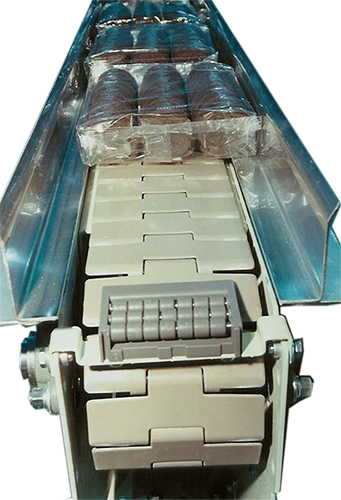 Sequentially lifts product off of conveyor providing pressure-less accumulation. Product is lowered back on to conveyor when line comes back up. Maximizes production throughput and efficiency. Ensures no damage to package.